Back in September we were surprised by the tactical Nintendo Switch title by the name of Mario + Rabbids: Kingdom Battle, which was developed by Ubisoft. It was already strange to see Mario in a tactical adventure, but even more peculiar was the fact that the game was developed by a different developer than Nintendo themselves. Nonetheless, the game turned out great, and when Ubisoft announced a new DLC for the title, involving the king of the jungle, Donkey Kong, it was impossible to hide our excitement. We first expected a short journey in the wildlands, but eventually we were treated to a full-fledged expansion, rather than a simple DLC that lengthened our playtime by only a few moments. In this DLC you’ll be treated to a separate storyline, where Beep-O and Rabbid Peach get sucked into a vortex to another dimension, together with the Donkey Kong Rabbid, which you defeated in the base game. Sadly, this time the DK Rabbid is stronger than ever, and he now controls all the other Rabbids, and is currently pestering this dimension. Luckily you come across the actual Donkey Kong and Rabbid Cranky, who will form a team with Rabbid Peach and Beep-O. You’ll have to work together as a team in order to find the missing parts of the washing machine, which caused the vortex in the first place. The story evolves pretty much in a linear fashion as in the base game, where you are constantly being presented with small problems which you have to overcome, all while being presented with funny and witty cutscenes which will certainly make you giggle more than once. While the gameplay remains mostly the same as in the base game, there are a lot more objectives to be found during battles. You will have to stop certain Rabbids from reaching a goal, pick up items and so on, spicing up the battles a lot more. Also, seeing you only have three characters during the duration of the entire DLC, you will only need to do one battle per level, making the flow faster and the battles more fun. 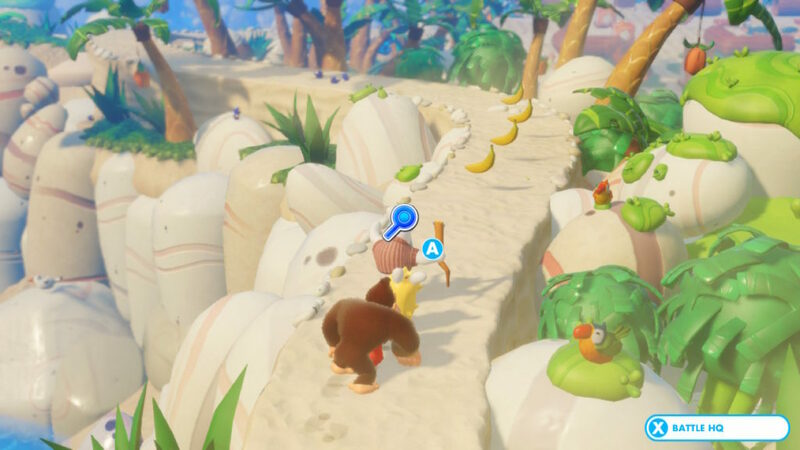 You’ll also notice that Donkey Kong has a few special abilities that also alter the flow and pacing of battles, as he can move around more via special tiles, he can pick up and throw enemies and his weapon can hit more than one enemy at a time, making him a very versatile character. 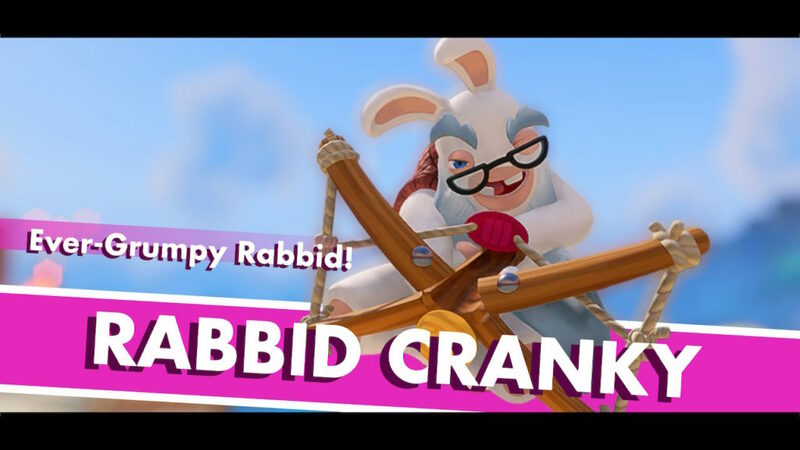 The other new party member, the Cranky Rabbid, is also a fun addition, and a beautiful wink to the Donkey Kong franchise. If you’re thinking a DLC such as this will only fill a small break in-between games, you’re absolutely mistaken. Donkey Kong Adventure is pretty much a third or half the length of the base game, depending on how much you explore(d) in the original, and how many puzzles you want to solve in this expansion. In terms of content and duration, you will certainly not be disappointed by this fairly lengthy bonus adventure. 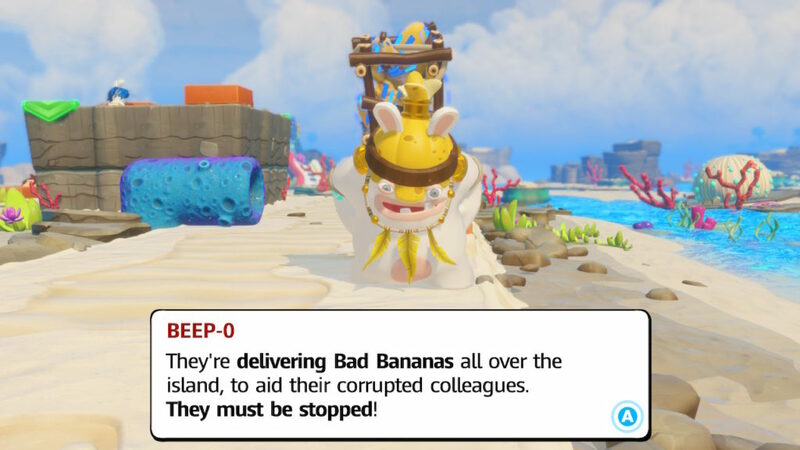 Mario + Rabbids: Kingdom Battle: Donkey Kong Adventure is a sublime DLC, that adds a lot of bang for its buck. You’ll be treated to a fun new storyline, a hefty amount of missions, new characters, cool weapons and a fun new map to explore, making it so that you’ll be set for several hours to come, rather than a treat in-between games. If you’re still on the fence for buying the base game, it’s best to consider buying the version that includes the DLC, as it is certainly worth it for those who love to see Nintendo characters star in a tactical title.